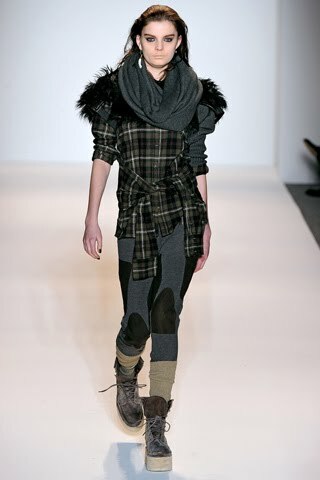 Two ensembles, above and one below, from the Nicholas K Fall 2011 collection. Photos from Getty Images. "YOU have to be crazy to have a show at 9 a.m.," asserted Richard, the wrangler of photographers at the tents, after the show of his namesake, Mr. Chai. He was responding to an observation about attendance at that hour's Nicholas K show. RC showed at 11 a.m. (more on him later). It was not exactly standing-room only in the Studio tent at Lincoln Center. And is there any wonder? Last night, tons of people were partying like it was 1999 at various parties, including the one for The Heart Truth's Red Dress Collection. 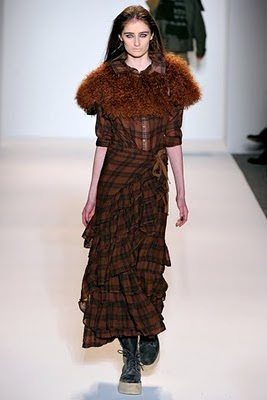 The heart collection marked the unofficial start of the Mercedes-Benz Fashion Week New York Fall 2011 Shows. Nicholas K was the official start at that aforementioned unseemly hour. “I was inspired by the woods and rustic living; the survival instinct and going back to primitive ways," Nicholas Kunz explains about the collection in press materials. "The fall colors of the forest are reflected in the palette and overall aesthetic and I used a lot of texture and incorporated Navajo inspired prints. Think log homes, gypsies, stone fireplaces, owls, camping and migration." It is - surprise! - a layer-heavy collection. 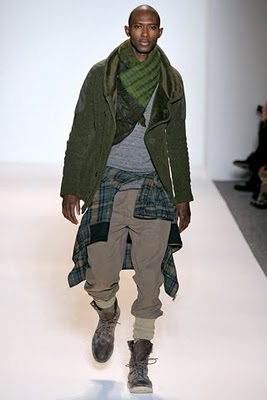 The clothes flow, even on men. Shirts are wrapped around the waist to mimic asymmetrical skirts. The colors are earth tones and jewel tones. It is very "The Tudors" on a casual scale. While NK does casual-hip extremely well, some of the A-line skirts and dresses in particular, possess cocktail-party aspirations. And is that chiffon? And that, over yonder, are those velvet or velour britches that guy is wearing? What's up with the scarf shrugs? NZ is definitely dressing up more for fall. No visible weaknesses here, as there is plenty to mix and match; dress up, down and around. NK started off the fashion parade in September when the tents brought the show to Lincoln Center. Perhaps, it will become a tradition. And what says Richard about this.